I had high hopes for Thursday night, what with Pitt in a winnable first-round matchup with West Virginia and the red-hot Pens making a short trip to Columbus, Ohio. And as I saw my beloved Panthers' hopes of appearing in roughly their 100th Big East Championship game this decade go down the tubes in a little over two hours, the Penguins were behind three goals in the third period. This night was not going as planned. Fortunately, the Pens' apparent deal with the devil is still intact, which means they somehow picked themselves off the mat for a team hat trick in a 3:25 span of the third period and stole a coveted point on the road, ultimately falling to Columbus 4-3 in a shootout. Sergei Gonchar started the comeback eight and a half minutes into the final period with a Sid-and-Kunitz assisted power play goal, Pascal Dupuis added a big one 1:20 later, and Max Talbot brought them all the way back two minutes after that. Marc-Andre Fleury sealed the point with a big-league save in the closing seconds, ensuring that the Penguins would once again be contributing a point to their playoff fund. The overtime was scoreless (although Kunitz did hit the crossbar), and the shootout didn't feature many offensive fireworks other than the lone goal by Columbus' Kristian Huselius. Wunderkind Jackets goalie Steve Mason turned away Letang, Crosby, and Malkin in succession, and the overflow crowd of 19,167 (105.7% full) could say they got to witness a pretty entertaining contest. It was the largest crowd in Blue Jacket history. The atmosphere was quite festive considering the proximity of the cities and the success Columbus has generated with their play this season. In fact, this very game tied a franchise record for wins (35). As the Pens' announcing team mused, it's a shame that we don't get to build on this rivalry very often. 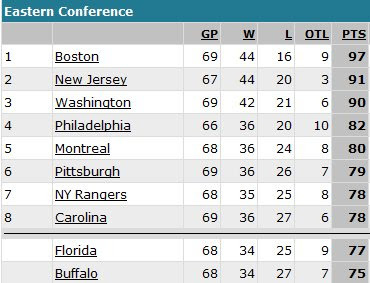 The Penguins will now return home for a well-deserved eight-game(!) homestand, featuring Ottawa and Boston this weekend, the Colby Armstrong Show on Tuesday, and LA on Friday. In the meantime, they can pat themselves on the back for saving the collective psyche of an entire city. Is it me, or is this team playing so much more physical than before? And not just the additions of Adams, Kunitz, etc, but everyone in general. The 3rd period was unreal last night. I wonder how many people tuned out after the 2nd period.